A lifetime committed to craft. I began studying metalwork at age twelve with internationally recognized artist blacksmith, Tom Joyce. By the time I graduated from high school, blacksmithing had become a calling to which I wished to dedicate my life. After studying ornamental ironwork with Joyce and others, I traveled to Japan as a journeyman. 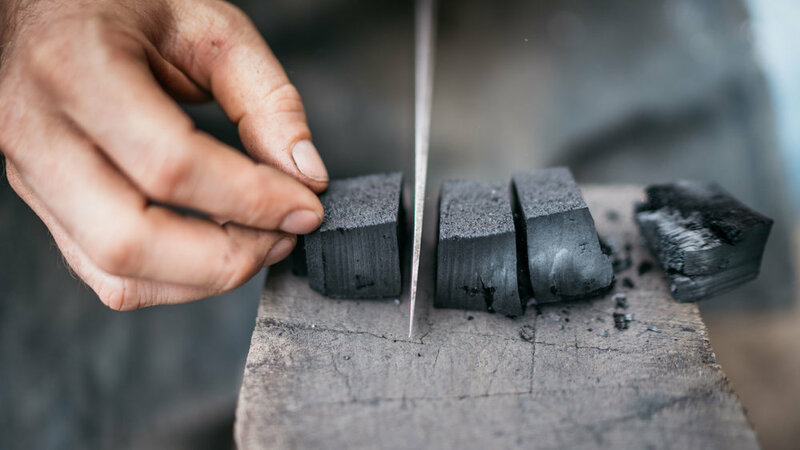 While visiting blacksmiths throughout the country I was fortunate to meet one of Japan's master knife-makers, Hiroshi Ashi, who kindly hosted me for the next two years.Thanks to his patronage I studied and practiced with many artisans in the city of Sakai, renown for its cutlery and bladesmithing. Pine charcoal is made and cut into pieces for use in the forge. I returned to Santa Fe in 2009 determined to build my own shop and make knives based on the techniques and philosophy that I learned from the craftsman of Japan. Each knife style is slightly different, but here is an overview of the basic steps that are involved. Steel is heated in the forge using a mixture of pine charcoal and coke. The tang is forged under the air hammer.